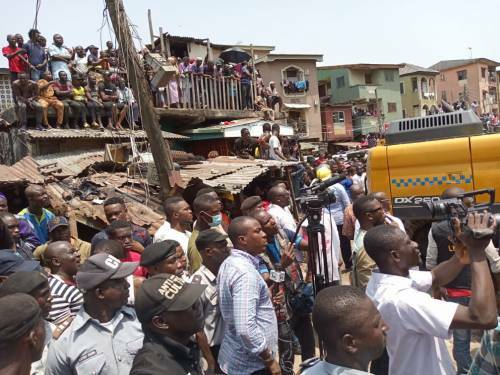 Around about 11am on Wednesday, a four-storeyed building containing residential buildings, a nursery and primary school as well as a shop complex on the ground floor, collapsed at Ita Faji on the Lagos Island, killing and trapping many people inside. The building, which was described by residents and rescue workers, as “very old” and “marked for demolition since last year”, came crashing after giving signs of fatigue. She added: “Do you know that even this morning, this house was shedding debris before it…” She didn’t finish, though; she was hushed from further speaking to us by other women who restrained from “saying too much”. Soon after the collapse, local residents started evacuating victims. “We had done like 25 before the government team came,” said Major, one of the dust-stained young people who spoke to SaharaReporters helping in the rescue effort. As if to confirm, the Lagos State government tweeted on it’s official Twitter handle @followlasg: “Ongoing rescue operations by the Lagos State Rescue Unit at the collapsed building at Ita-faji, Lagos Island” at precisely 12:28PM, almost two hours after the initial incident. As rescue efforts went on in the scorching sun and without much luck, outgoing Governor of Lagos State, Akinwunmi Ambode, drove in with his security team to assess the situation. He was greeted by some emergency rescue officials from the Lagos State Emergency Management Agency (LASEMA) who briefed him about ongoing efforts for about two minutes. Shortly after the briefing, Ambode made to enter his car but he was asked by SaharaReporters and other newsmen present to address the press. He agreed, some metres away from the scene. Speaking with newsmen, Ambode said: “I have been told it is an old and illegal building. It is unfortunate that this happened. Rescue efforts are still ongoing, we appeal to residents to allow rescue efforts go on smoothly”. And with that he melted into the crowd and drove off but not without mild drama from a concerned male resident of the area who at the top of his voice beckoned on the Governor to “do something to end this nonsense”. The Governor’s appearance at the scene lasted a paltry seven minutes or thereabouts. He called on the Lagos State Government to “do all that is needful, so that such tragic developments do not recur”. As rescue efforts got underway, hours passed with little luck, most of it owing to the lack of basic equipment such as flashlights to see through bored holes and crevices. There was also an urgent call for wrappers by rescue worker in order to form a tight rope cord in the absence of actual ropes. The response: flying scarves and wrappers from spectators. At the Island General Hospital in Marina, worried family and friends littered the parking area, reception, mortuary, wards and anywhere they could get word from, on their relatives currently receiving treatment. SaharaReporters observed that anytime an ambulance pulled in, the people rallied, some with hope on their faces and others with hands on their heads, waiting for the door to fling open with some news of their loved one. SaharaReporters counted 41 names pasted by the hospital management of stable victims in their custody. The FG has sent a delegation of the National Emergency Management Agency NEMA (NEMA), led by Air Commodore Akugbe Iyamu, to the scene of the collapse to ascertain the level of damage. Speaking to journalists after assessment, he said: “The incident is noted and investigations will be launched to forestall future occurences.” He observed with dismay that “locals didn’t allow rescue efforts go on as fast as we would have wanted it to”. He said the agency would collaborate with LASEMA to provide relief materials for the victims as rescue operations come to an end. Official figures are yet to be released by NEMA. However, SaharaReporters estimates about 19 people dead with over 41 survivors still receiving treatment. As of the time of filing this account of events witnessed by SaharaReporters, rescue had come to an end, and the process of clearing the rubble had commenced. At the Island General Hospital, Marina, the crowd is growing, filled with family and concerned Nigerians who have either come to be with their affected relatives or to collect the body of their dead.